Garolera, D.; Aliguer, I.; Carol, I.; Martínez, J.M. ; Lakshmikantha, R.M. ; Alvarellos, J.
Zero-thickness joint/interface elements of the Goodman type, have been advantageously used to solve many problems in solid mechanics involving material interfaces or discontinuities. Some years ago, the authors have also proposed a version of such element for flow/diffusion and hydro-mechanical (H-M) coupled problems, either geomechanical or multiphysics. Some advantages are for instance that fluid pressure discontinuities and localized flow lines may be represented on the same FE mesh used for the mechanical problem, as well as the influence of fluid pressure on mechanical stresses or, conversely, of crack openings on the flow redistribution ( Zero-thickness joint/interface elements of the Goodman type, have been advantageously used to solve many problems in solid mechanics involving material interfaces or discontinuities. Some years ago, the authors have also proposed a version of such element for flow/diffusion and hydro-mechanical (H-M) coupled problems, either geomechanical or multiphysics. Some advantages are for instance that fluid pressure discontinuities and localized flow lines may be represented on the same FE mesh used for the mechanical problem, as well as the influence of fluid pressure on mechanical stresses or, conversely, of crack openings on the flow redistribution ("cubic law"). 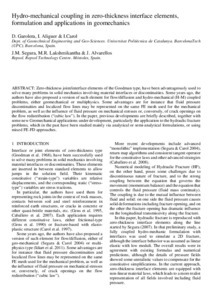 In the paper, previous developments are briefly described, together with some new Geomechanical applications under development, particularly the application to the hydraulic fracture problems, which in the past have been studied mainly via analytical or semi-analytical formulations, or using mixed FE-FD approaches. Garolera, D. [et al.]. Hydro-mechanical coupling in zero-thickness interface elements, formulation and applications in geomechanics. A: ISRM European Rock Mechanics Symposium. "Rock engineering and rock mechanics: structures in and on rock masses : Proceedings of EUROCK 2014, ISRM European Regional Symposium, Vigo, Spain, 26–28 May 2014". Vigo: CRC Press, 2014, p. 1379-1384.